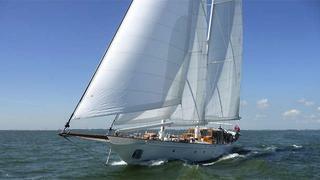 Back in 1999, Bloemsma van Breemen in Makkum, the Netherlands, laid the keel for a project then known as Green Seagull. Shortly after the superstructure was fitted, the project was shelved due to unforeseen circumstances. The incomplete yacht was purchased in 2011 by her current owner, who chose to finish the construction by himself. He asked Olivier van Meer Design to come up with the sail plan and interior design for the boat, rechristened Neorion. The brief specified that it should be possible for just two persons to sail her. Hydraulic furling systems and an ergonomic cockpit layout ensured that the yacht would be very easy to manoeuvre. During the construction, van Meer was eventually asked to take on all project management responsibilities for the owner. A building team was put together under his guidance, consisting of small specialist companies from Enkhuizen. The sea trials were successfully completed recently, and Neorion is now en route to Svalbard for her maiden voyage. Olivier van Meer is currently preparing the comprehensive renovation of a 125' classic schooner, including a completely new interior design. The final touches are being put to the specifications and technical drawings. The project will be implemented directly for the owner under the guidance of Olivier van Meer. The office is currently also working on the design of a 95-metre square rigger for training, and the construction of several Puffin yachts.